"I ain’t going nowhere.” That’s George T. Stagg, for ya. Each year, Buffalo Trace launches its Antique Collection, featuring George T. Stagg. This Bourbon is aged to perfection and delivers a real Whiskey rhapsody. Uncut, unfiltered and untouched, this is a Bourbon that makes your heart tick faster. 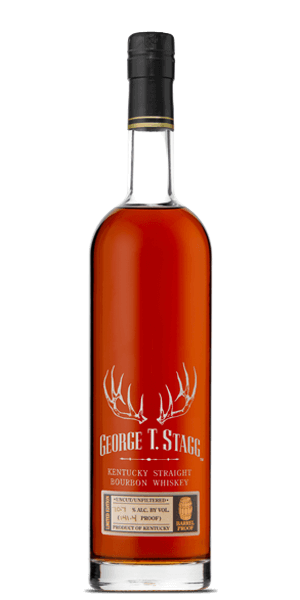 What does George T. Stagg Kentucky Straight Bourbon Whiskey 2018 Release taste like? The Flavor Spiral™ shows the most common flavors that you'll taste in George T. Stagg Kentucky Straight Bourbon Whiskey 2018 Release and gives you a chance to have a taste of it before actually tasting it. S.A.K. Flavor bomb, strong burn. Part of their antique collection and fantastic!